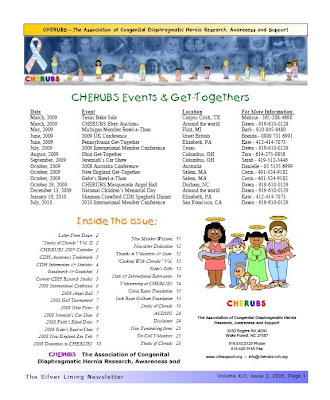 The first awareness ribbon or bracelet for CDH was discussed on CHERUBS old listservs in 2004. Because all the colors are taken, we didn’t want to impede on any other cause’s ribbon or their awareness efforts. 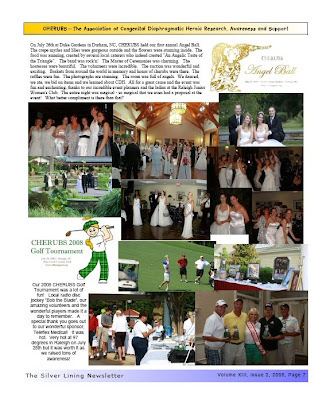 Besides, we widely used the “cherub” as our awareness symbol for CDH. We tossed the idea around and talked about it with CHERUBS members but there was no real desire to join in on the awareness ribbon bandwagon. 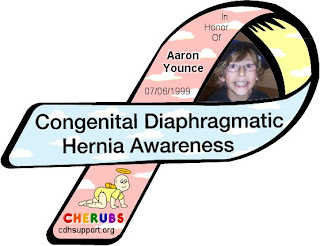 The very first awareness ribbon for Congenital Diaphragmatic Hernia was a turquoise ribbon created in memory of Drew Lewallen in May, 2006 and posted on Rainbow of Hope. Many of us feel that this is Drew’s ribbon – and it is. Permission to use this ribbon on a larger scale for fundraising for 1 organization only and ownership of this ribbon was never given and copyrights belong to Drew’s family. Because of awareness issues now associated with another organization’s co-opting of Drew’s ribbon and trying to trademark it (twice), most families refrain from using the turquoise ribbon. 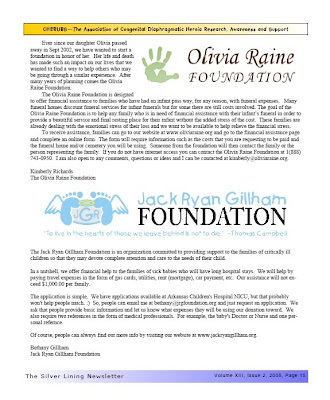 Most families affected by Congenital Diaphragmatic Hernia view wearing turquoise or a turquoise ribbon as endorsing the trademark and helping to fund and encourage a corporation’s bid to profit off their babies’ pain and suffering and control awareness of this devastating birth defect. Many families do not want to be walking, talking billboards for something that they find morally and ethically wrong. 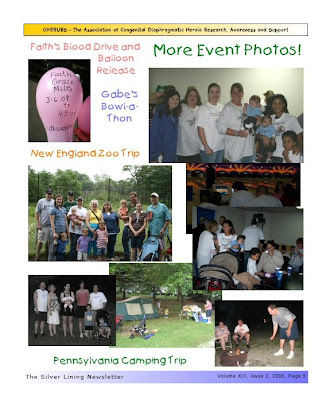 The Congenital Diaphragmatic Hernia community needed an awareness symbol that was free, not tainted with any ulterior motives, owned by no one and chosen by CDH families. We also wanted something that belonged to just the CDH community and not several other causes. The turquoise ribbon happens to also be used by many organizations and the public for Addiction Recovery, Lymphedema, Native American Reparations, Sexual Assault, Ovarian Cancer, Anxiety Disorders and more. We are nothing if not original at CHERUBS and ethically, we could not have used a ribbon color that belonged to another cause or was copywritten by Drew’s family. Besides, these CDH babies are so special that they deserve an original awareness ribbon all their own – so we came up with several ideas for an original awareness ribbon. 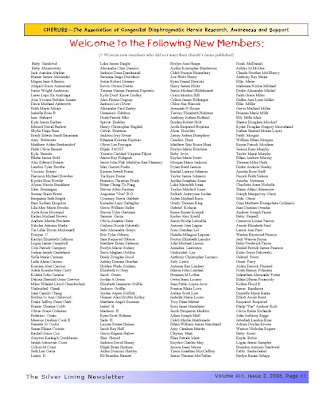 Members of several organizations voted for many days and a decision was made. 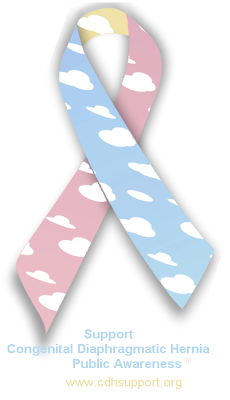 The official congenital diaphragmatic hernia awareness ribbon, as voted on by CDH parents and survivors, is baby blue, pink and pale yellow with clouds. 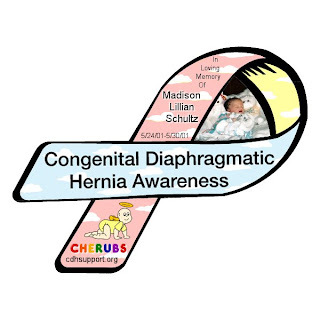 This is the Congenital Diaphragmatic Hernia Awareness Ribbon recognized by the members of the Alliance of Congenital Diaphragmatic Diaphragmatic Hernia Organizations. 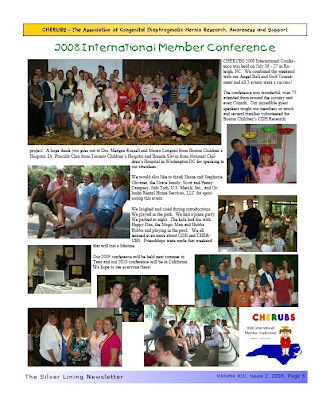 Is it recognized by CHERUBS, the world’s first and largest CDH organization with over 2800 members in 38 countries. 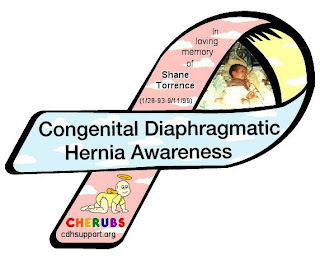 It is the ribbon associated with the Congenital Diaphragmatic Hernia Research Study. Wikipedia recognizes this ribbon. There is even a postage stamp with this ribbon, created February 12, 2008. Not to mention 1000’s of items with this ribbon available on our stores and various other sites. 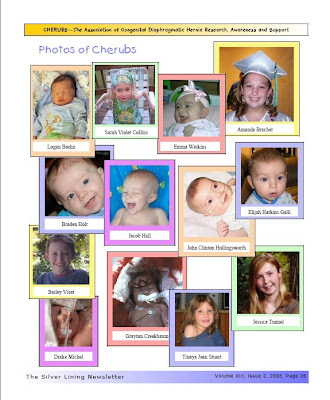 If you would like one, please e-mail your child’s photo, name and date(s) to ribbons@cherubs-cdh.org and Fer and Barb will make your ribbon as soon as possible. 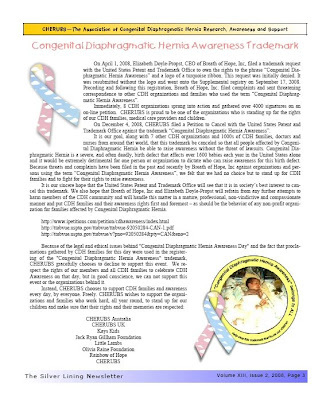 The Official Congenital Diaphragmatic Hernia Awareness Ribbon is on 1000’s of web sites, including those belonging to CDH organizations and the CDH Blog Ring. We are also putting together a list of all the web sites that post this ribbon. If your web site is posting this ribbon please comment to this blog post with the URL to your site. And feel free to comment and tell us how you are using this ribbon! 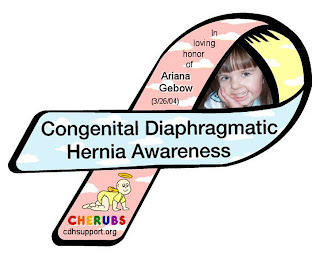 CHERUBS will personalize a Congenital Diaphragmatic Hernia Awareness Ribbon for any CDH family for free. A special thank you to Barb Wagner and Fernanda Arce for creating the ribbons for us! We have personalized ribbons for over 100 CDH families so far! 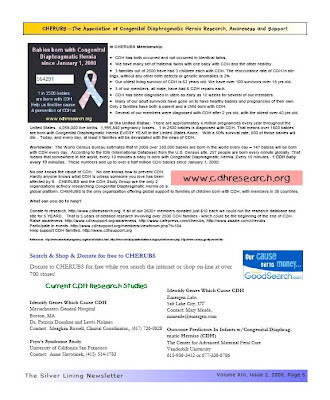 Why is the CDH Awareness Ribbon blue and pink and yellow with clouds you ask? 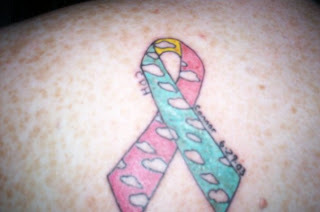 Several years ago on our old listserv, members of CHERUBS (then the only CDH group on the internet) talked about having an awareness ribbon. We batted the idea back and forth and didn’t go much further with it because it every color was already taken and it seemed a bit tacky to take a color that already belonged to other causes – we didn’t want to take away from their hard work promoting their cause with their ribbon. And we didn’t want to compete with other causes for a ribbon color, because well… that’s not very professional. A couple of years ago, cherub with wings, Drew, had a ribbon made especially for him that his mom put on the Rainbow of Hope site. 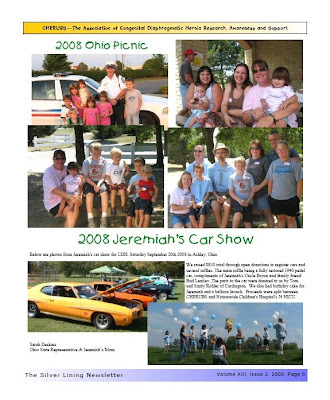 RoH is a site dedicated to Drew’s memory that has information about CDH. Jana is a sweetheart and well respected in the CDH community. Drew’s ribbon is turquoise. 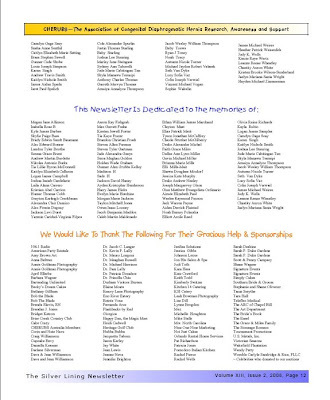 Last year an organization decided to ‘borrow’ Drew’s ribbon for their own CDH ribbon. 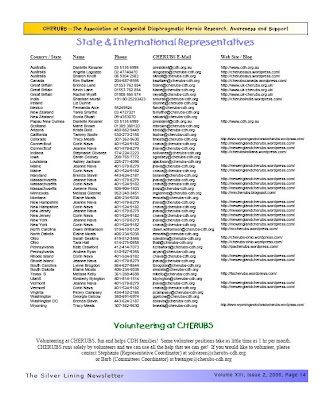 Soon this organization claimed rights to all CDH Awareness activities, events, etc – even tried to have this ribbon trademarked as their own – based on the fact that they wrote a few letters to governors for CDH Awareness Day proclamations. Because this was their project, CHERUBS respected it and stayed out of it. But soon other groups and parents who used that color ribbon or who said “Congenital Diaphragmatic Hernia Awareness Day” without explicit permission of this small group of about 35 real people were getting threatened with lawsuits. 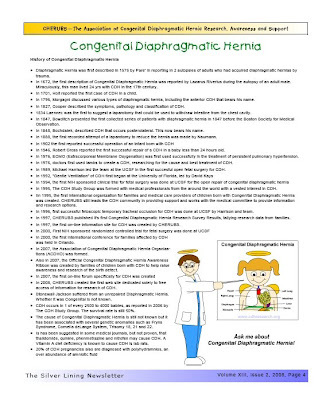 Then CHERUBS was getting threatened if we didn’t stop using the term “Congenital Diaphragmatic Hernia Awareness”. 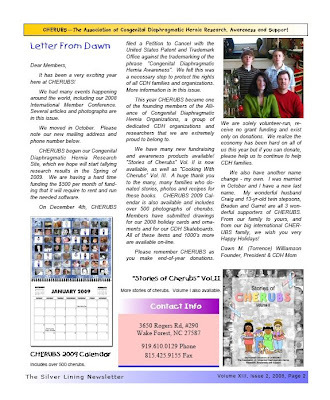 CHERUBS tries to steer clear of all drama – but we do stand up for CDH families. The decision was made to not use the turquoise ribbon to avoid further drama and threats from that group. 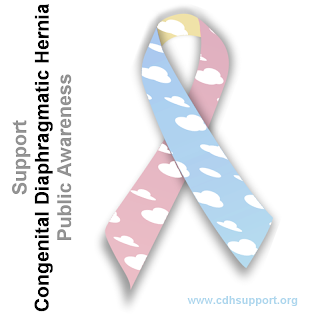 Last year, our members asked for an official Congenital Diaphragmatic Hernia Awareness Ribbon – one that was chosen by CDH families, not used by other causes and not embedded in threats and drama. All of our over 2000 members – all CDH families – were asked to recommend and then vote for the official CDH Awareness Ribbon. There were several different ideas that went around but one thing was for certain – we wanted a ribbon that represented our children, our cause – a ribbon that is owned by ALL CDH families and can be used without fear. Not something assigned to them or dictated to them, not something some politician who is clueless about CDH signed on unintentionally, but something that they chose for their children. Baby blue, pink and yellow… similar to the ribbon for birth defects and clouds for those cherubs who do not survive – because half of these children do not survive. To us, the turquoise ribbon is Drew’s ribbon and always will be… something sacred that belongs to his memory. How amazing that Jana chose to allow others to use it and how amazing she is to put up with all she has because of it. This is not CHERUBS’ ribbon. It is not the ribbon of any 1 organization or person. This is the official Congenital Diaphragmatic Hernia Awareness Ribbon and it belongs to ALL of the families and children affected by CDH.